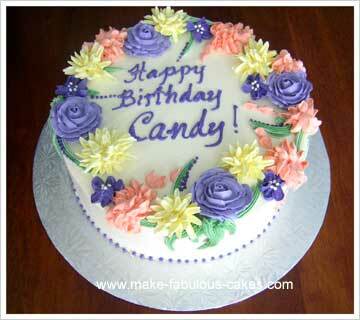 Give a flower birthday cake to that special someone when the occassion arises. 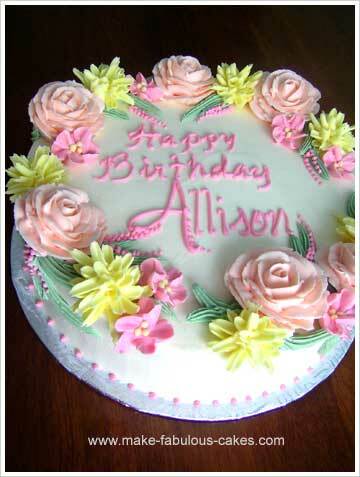 Here are some ideas for flower birthday cakes. All the flowers are made out of buttercream. 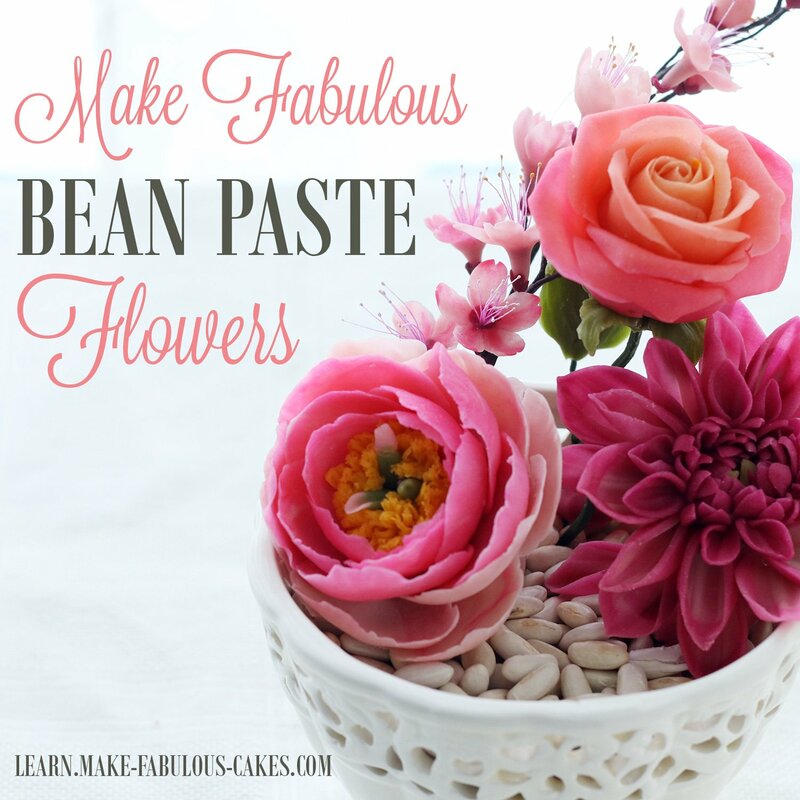 These flower cakes are not only limited for birthdays, make them for mother's day, bridal showers or just because. 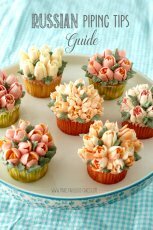 For most of these cakes the general instructions are found in this article on all buttercream flower cakes. 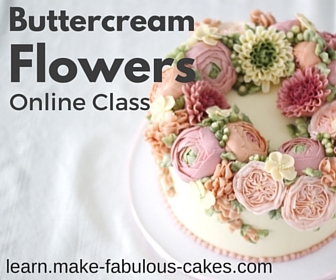 Want to learn more on making buttercream flowers? 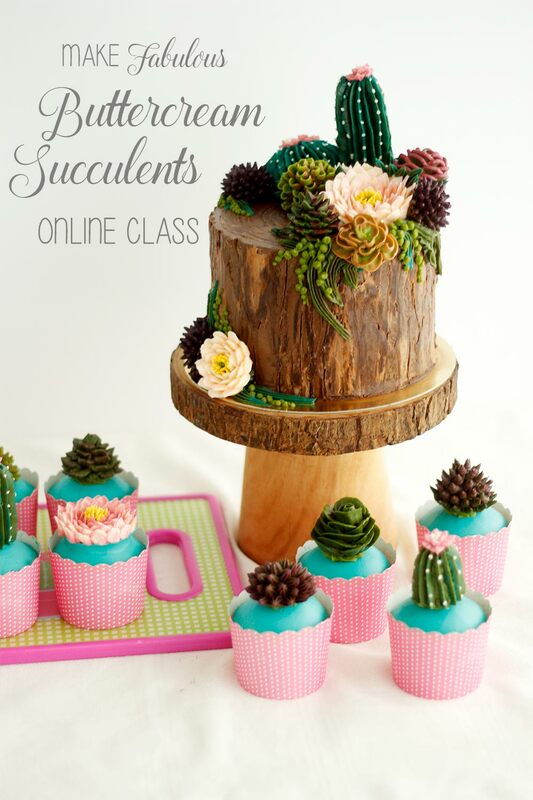 Check out this online class! For this cake, I wanted the colors to be really feminine and soft. 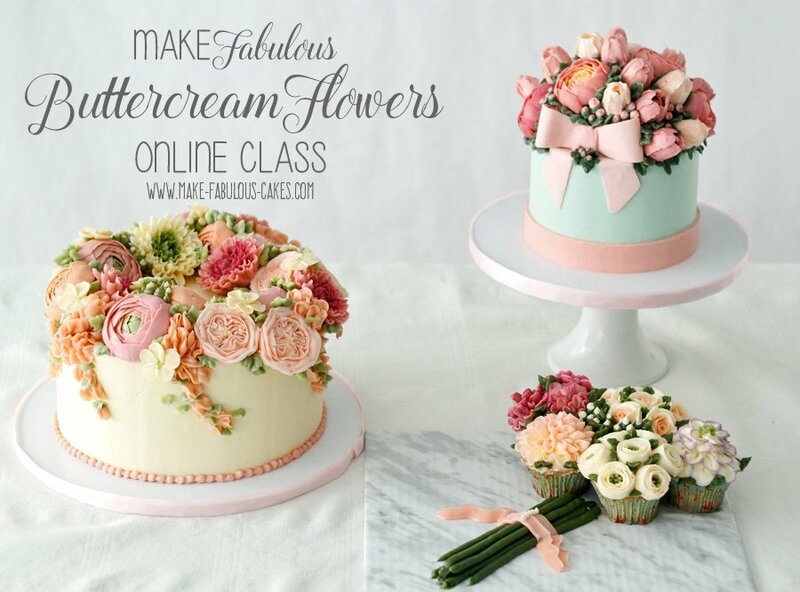 I colored the buttercream light peach, yellow and pink for the flowers. For leaves I used willow green color. With tip # 18, make the leaves on the edge of the cake. 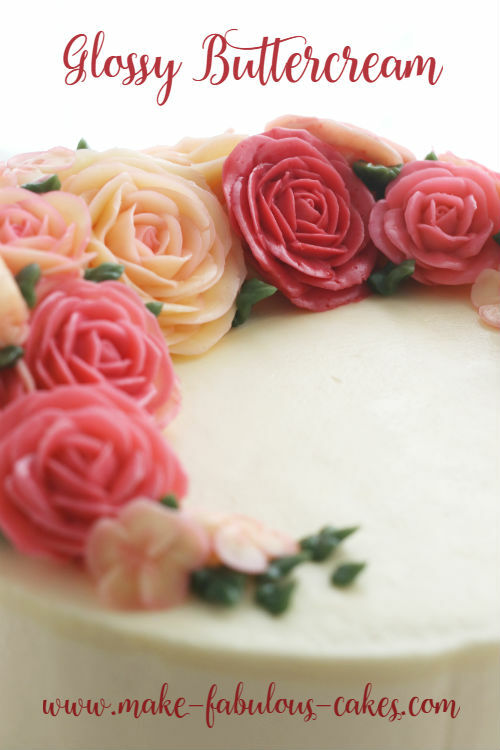 Make roses using tip # 104 peach buttercream and place a few around the cake. Make yellow chrysanthemums with tip # 81. 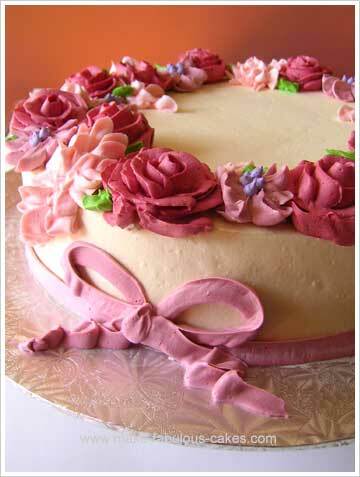 With tip # 104 and pink buttercream, make five-petal flowers around the cake. Use round tip # 2 to make some three dots in the center of the flowers. 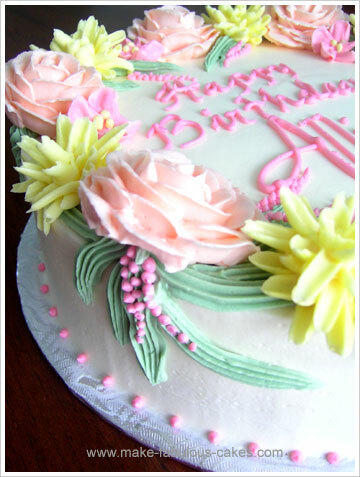 Using the same pink icing but using tip # 2 this time, pipe a line of dots on the some of the leaves as pictured. Here's another cake with same methods but different colors. 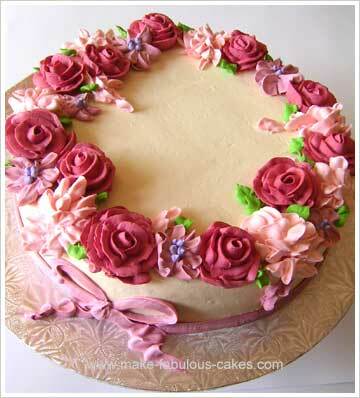 And a flower birthday sheet cake using same methods but different shape. 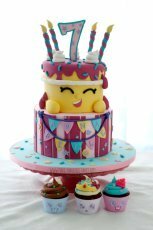 I used two 9" X 13" sheet cakes side by side for a cake to serve approx. 50. 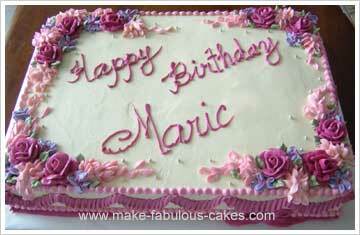 For the sides, I used tip #104 to make the scalloped ruffles around the cake. 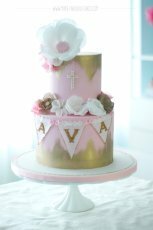 For this cake, I used different shades of pink for a monochromatic look. I used pink mixed with a bit of red for the dark pink icing and Rosy mauve and a very light pink for the other 2 colors. For leaves, I used Leaf color. 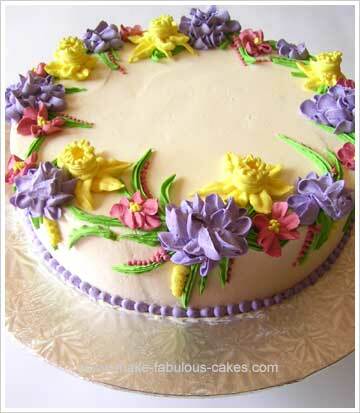 I used just one icing tip for this cake , which is 104, for all the flowers. 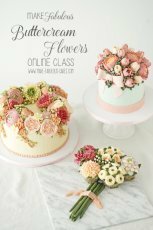 I used dark pink buttercream for the roses, rosy mauve for the simpler flower and light pink for the clusters of petals. I then mixed a bit of purple to one of the colors and used tip # 2 to pipe dots in the center of the simple flower. Using the same tip#104, I piped a ribbon and a bow around the bottom part of the cake. For leaves, use icing tip#67 to pipe it. 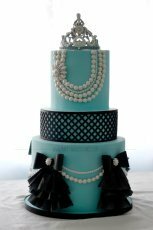 This cake was made for 3 celebrants in mind and , 2 men and a lady, so the cake has to be pretty much unisex. In place of the usual roses and other flowers, cluster of grapes were added instead. First I piped a large continuous vine using tip # 10 near the edge of the cake. 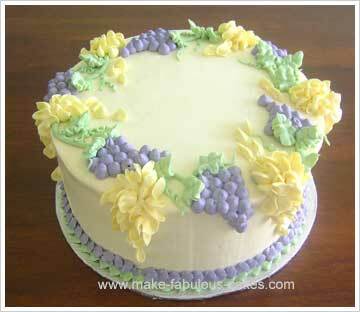 I used the same tip#10 with purple buttercream to pipe a cluster of dots resembling grapes. 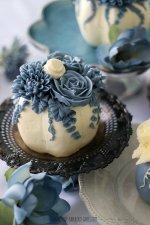 With tip# 104 and light yellow buttercream, pipe a cluster of petals on the empty spaces. Finish off by piping leaves using tip#67. Pipe some small curly vines using tip#1 or 2. 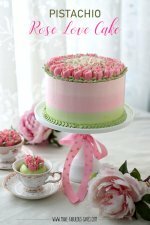 This cake is perfect for that spring birthday when daffodils bloom. Pipe the leaves using tip#18 all around the edges of the cake. Using tip#61 and purple buttercream, pipe clusters of petals. With tip#104 pipe pink blossoms and add yellow dots in the middle with tip#2. 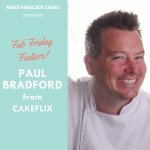 For the daffodils, use yellow buttercream. For the base, use leaf tip #67 and pipe 6 leaf-like petals in a circle. Next, using round tip # 10, pipe in circles building up the middle of the flower. Then with round tip # 3, pipe a squiggly line on top of it in a circle.